When you have a business, your investors or other interested parties want to know how it is performing. What shows your business results is accounting or bookkeeping. It is considered the language of a business because it lets your company communicate through financial statements. Create entries for each transaction and book them to the specific account. Define accounts for cash, banks, savings and group them in the corresponding account group such as short-term debt or current assets. Merge your invoicing and payroll databases and get a highly customizable accounting software for your individual needs. 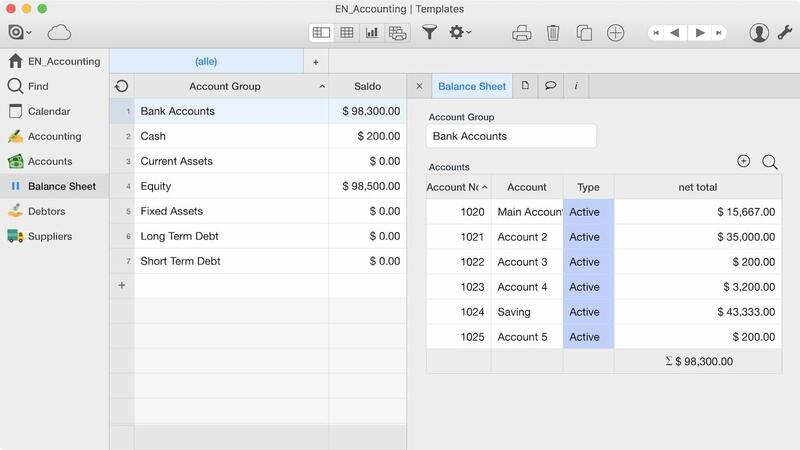 Your balance sheet will show up automatically. This will provide a snapshot of your business' health at a point in time. Use the app to calculate financial ratios and see your company’s flexibility and liquidity and make the next business decision with ease of mind.